John recognized that, without love, we fall into bitter rivalries that lead, eventually, to violence and death. He wrote, “Whoever does not love abides in death. All who hate a brother or sister are murderers, and you know that murderers do not have eternal life abiding in them. . . Little children, let us love, not in word or speech, but in truth and action.” (1 John 3:14b-15, 18) John noted that words alone are meaningless; love is about action. 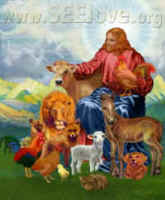 This is similar to Jesus’ comment, “Not every one who says to me, ‘Lord, Lord’ shall enter the kingdom of heaven, but he who does the will of my Father who is in heaven.” (Matthew 7:21) Therefore, while many people say they “love animals,” truly showing love means helping animals in need and doing one’s best to not contribute to their misery. Throughout his ministry, Jesus taught that God wants us to love: “a lawyer stood up to put him to the test, saying, ‘Teacher, what shall I do to inherit eternal life?’ He said to him, ‘What is written in the law? How do you read?’ And he answered, ‘You shall love the Lord your God with all your heart, and with all your soul, and with all your strength, and with all you mind; and your neighbor as yourself.’ And he said to him, ‘You have answered right; do this, and you will live.’” (Luke 10:25-28) Note that the first part is to love God totally, and then to love your neighbor as yourself. If one dedicates oneself totally to God, one will naturally love God’s Creation, which includes fellow humans, God’s animals, and God’s physical world in which we live. In this passage, the lawyer then asks who is one’s neighbor, and Jesus replies with the parable of the Good Samaritan. An important point here, and in many other passages, is that the Bible describes love in terms of action. This differs from the commonplace notion that love is about feelings. Showing love, rather than just claiming to love, is how we discern true prophets from false prophets. Jesus said, “Beware of false prophets, who come to you in sheep’s clothing but inwardly are ravenous wolves. You will know them by their fruits.” (Matthew 7:15-16a) In other words, by works can one discern true prophets of God from false prophets who claim God’s inspiration but actually serve themselves. Indeed, John wrote, “If anyone says, ‘I love God,’ and hates his brother, he is a liar” (1 John 4:20). The Apostle Paul recognized the centrality of love in Jesus’ teaching: “Owe no one anything, except to love one another; for he who loves his neighbor has fulfilled the law. The commandments, ‘You shall not commit adultery, You shall not kill, You shall not steal, You shall not covet,’ and any other commandment, are summed up in this sentence, ‘You shall love your neighbor as yourself.’” (Romans 13:8-9) Similarly, Paul wrote, “For the whole law is fulfilled in one word, ‘You shall love your neighbor as yourself.’” (Galatians 5:14) I think that it is notable that the law was given to the Hebrews as an act of love from God, and the Hebrews were called to follow the Law to express their love for God. The Apostle Paul did not condemn the Law. Rather, he summarized the Law as Jesus had done: You shall love your neighbor as yourself. Next week, we will look at Jesus’ forgiving Peter as an example of love-in-action.